On a whale watching tour off Northern Vancouver Island in British Columbia, Canada, a male Orca displays his tall dorsal fin as he surfaces. 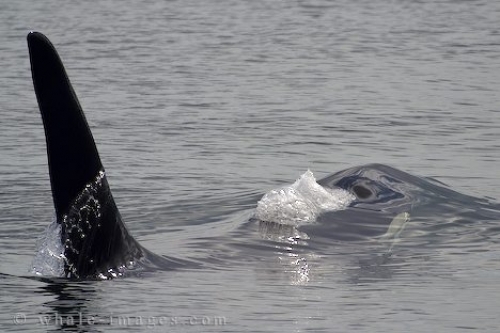 A large dorsal fin of a male Orca appears as this whale surfaces in the stillness of the ocean waters off Northern Vancouver Island in British Columbia, Canada. The water trails off his fin while bubbles explode from his blow hole just before the rest of his head appears above the water line. Under the surface, you can see the white patch around his eye which are prominent white markings on this marine mammal. The black and white colors of a killer whale are what makes the Orca so easy to recognize when in the wild. While Orca whale watching, the first thing that usually comes to the surface is the dorsal fin of either the male or female. Some of the full grown male Killer Whales seem to take forever before their heads appear above the surface as their dorsal fins can reach heights of six feet. If you get the opportunity to see an Orca whale or its pod out in the wild, you can easily tell the difference between the two sexes as the female's dorsal fin does not sprout up like the male's and only grows to be about three to four feet high. If it is a young male, their dorsal fin will not start sprouting until they begin to mature and suddenly their growing rate happens very quickly. Whale watching off Northern Vancouver Island in British Columbia, Canada is one of the best areas to watch Orca whales. They spend a considerable amount of time in these waters each year from July to October and the success rate to see these magnificent animals is very high.